So I made these breakfast cookies--the ones I mentioned here. I have never made a breakfast cookie before but it has two of my favorite words in its name, so it seemed like a sure thing. Then I got a little scared when I saw that they had no butter, no sugar, and no eggs. I was suddenly put in mind of these all natural "healthy" cookies my friend Carrie's boyfriend in college once made (he was all into yoga and not showering and listening to the Dead--you know the type--you may have dated one in college yourself)--and how she described them as tasting like small rocks. Just to be clear, rocks are not my idea of breakfast or cookies. Look, I like the idea of something healthy, but would Beeper actually eat them as he ran out the door to catch the bus? Would I eat them as I ran out the door to work? The answer is YES--in fact, Beeper eats them for breakfast, and then he asks for one later as an after-school snack. Okay, I did make a few modifications to the recipe. I did not want them too be too overwhelmingly banana-y so I actually only used 1+1/2 bananas and then substituted 3/4 cup of applesauce for the remaining bananas. Yep--that still kept it in the realm of all wholesome. But then I thought they might be sort of good with peanut butter so I added about 1/3 cup of PB. And then when I tasted the batter it did seem a little bland so I went ahead and put in 1/4 cup of honey to sweeten it a bit and after that it worked for me. 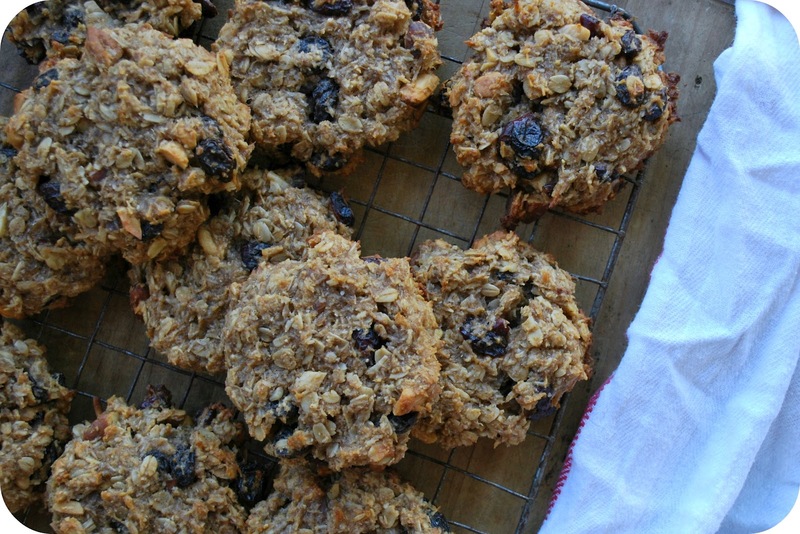 They are just mildly sweet and oatmeal-y and nutty and coconutty with an undercurrent of banana. Mine did take an extra 5-minutes of baking time too. But I would definitely make these again--and am thinking about how I could further customize the recipe to still be healthy but maybe taste a bit more like the Ranger cookies my mom used to make. You can find the original recipe here, at Blueberry Girl. Recipe customization is at your discretion--although I would not think any less of you if you were tempted to throw some chocolate chips into these. How delicious! I can't wait to make these.